Martin Schongauer (1450-1491) was born in Colmar. His father was goldsmith and had bought the rights of bourgeoisie in 1445. After a travelling training and a probable passage in Flanders, Schongauer came back in Colmar where he created several of his major works. In 1477, he bought the house "Zum Schwan" to set up his studio. 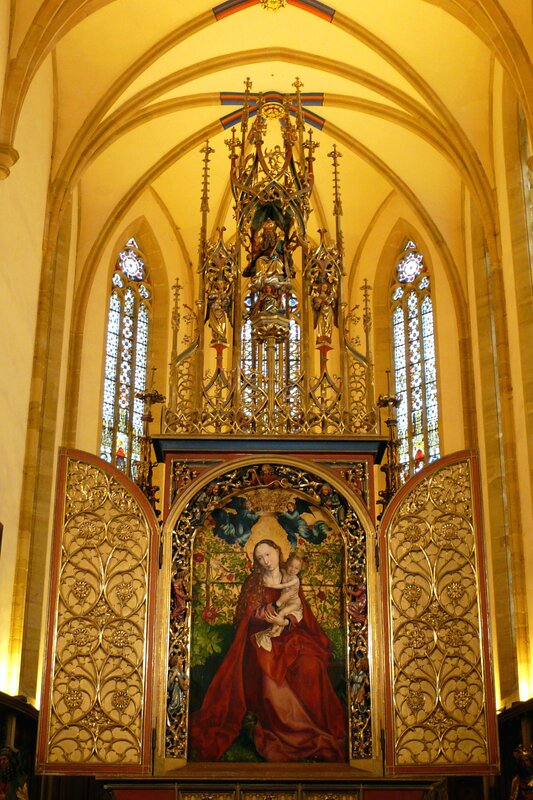 If we know him as an eminent painter, for example for his masterpiece “the Madonna of the Rose Bush” (1473, today in the Dominican church), the altarpiece of Orlier or the Dominicans (both preserved at the Museum Unterlinden), his contemporaries knew him more for his engravings. They were real references in the West and inspired an entire generation of artists. It is also said that Michelangelo made a reproduction of « a tentation of Saint Anthony ». One hundred-sixteen engravings have survived, mostly signed with a monogram « MS » and today exposed at the Unterlinden Museum. He died February 2, 1491 of the plague in Breisach, where he worked on the realisation of « The last judgment » fresco. The town where he was born payed him homage in many ways and in particular with a fountain made in 1860 by Auguste Bartholdi and placed in the closter of the garden at the Unterlinden’s Museum. After the dismemberment of the fountain in 1958, the sculpted figures were placed at the Unterlinden Museum. Martin Schongauer’s sandstone statue was setting up in front of the choir of the chapel in Unterlinden in 1991.